Traveler and preacher; born in Dobrowitz, Bohemia, 1710; died in Brahilov 1768. He was father-in-law to Solomon Dubno, and was a preacher in Brahilov. In 1764 he wrote an account of his journey to Palestine, "Ahabat Ẓiyyon" or "Sippure Ereẓ, ha-Galil" (Grodno, n.d.). A large portion of this book in its printed form was, however, written by the Karaite Samuel ben David, an earlier traveler in Palestine. 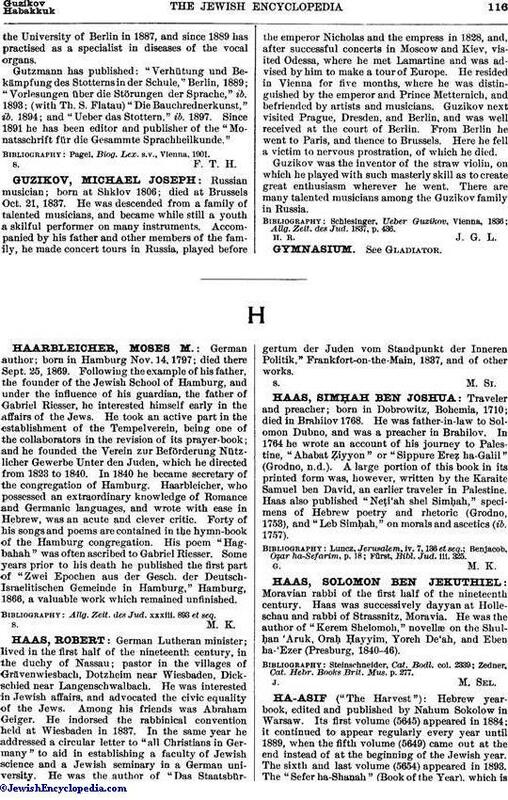 Haas also published "Neṭi'ah shel Simḥah," specimens of Hebrew poetry and rhetoric (Grodno, 1753), and "Leb Simḥah," on morals and ascetics (ib. 1757). Fürst, Bibl. Jud. iii. 325.